There is a historical inverse relationship between commodity prices and interest rates. The reason that interest rates and raw material prices are so closely correlated is the cost of holding inventory. When interest rates move higher, the prices of commodities tend to move lower. When interest rates move lower, commodities tend to rise in price. In a low-interest rate environment, the cost of financing stockpiles is lower than when interest rates are high. Think about a business that manufactures a product that requires metals, minerals or energy. It is a lot cheaper to store long-term requirements of the goods needed in manufacturing when the cost of money is low. The cost of carry is a term that commodity consumers (and producers) use to describe the costs associated with holding inventories for a period. Since the global financial crisis of 2008, central banks around the world lowered interest rates to unprecedented levels. These monetary authorities also employed a tool, quantitative easing (QE), which allowed them to repurchase sovereign and, in some cases, corporate debt instruments or bonds. Central banks do not control long-term interest rates, but they do set the levels for very short-term borrowing. In the United States, the rate that the U.S. Federal Reserve charges member banks for short-term loans is called the Fed Funds rate, set each month by the Federal Open Market Committee. Markets often anticipate the central bank’s decision about short-term rates. Many considerations determine the level of the Fed Funds rate. A central bank must assess the state of the domestic and global economy. Micro and macroeconomic factors contribute to the direction of interest rates. Economic growth is a critical concern for central banks. If an economy is growing quickly, the monetary authority becomes more likely to raise rates or tighten credit to slow down growth before it accelerates too fast. Hawkish or higher interest rate policy occurs when a central bank is in a tightening phase. When the economy slows, the central bank will often loosen credit to provide stimulus to the economy. Dovish or accommodative policy occurs when a central bank is in a loosening phase. Hawkish or dovish policy often happens in a cycle that can last years. Other factors that can influence the monetary policy of a central bank are labor/job growth/contraction statistics, inflation data, and influences from other economies around the world. When a central bank tightens, it means that growth in some areas is occurring rapidly and needs to slow down. When a central bank loosens monetary policy, it often means that the economy is lethargic and needs a jumpstart. While the short-term monetary policy is the result of central bank policy decisions, long-term interest rates are determined solely by market forces in a free economy. However, short-term policy changes often influence longer-term debt instruments. There is not a 100% correlation between the level of short and long-term rates, but more often than not, when short-term rates move lower, longer-term rates will follow and when short-term rates increase, longer-term rates will climb as well. Since the 2008 financial crisis, the central banks of the world have been in a long-term accommodative or dovish cycle. In this dovish phase, the central banks have attempted to stimulate growth by encouraging borrowing and spending and inhibiting saving. Often, low-interest rates will do the trick, but the shock to the system around the world in 2008 was such that unprecedented amounts of loosening became necessary for a prolonged period. At first, the accommodative policies caused the prices of commodities to move higher given the historical inverse relationship between rates and raw material values. When it became apparent that the U.S. Fed would end its quantitative easing policy and start considering interest rate hikes while other nations continued on a dovish path, the prices of many commodities moved lower. Complicating matters were the relationship between U.S. interest rates and the currency of the United States, the dollar. As the market believed that a less accommodative monetary policy would eventually cause a higher yield for dollars compared to other currencies in the world, the dollar began to appreciate against other foreign exchange instruments. In May 2014, the dollar embarked on a significant rally that took the dollar index from around the 79 level to over 100 in one year. While interest rates remained at historically low levels, the market believed that they would rise as the Fed statements switched from a dovish to a hawkish stance on monetary policy, thus causing the dollar to increase in value compared to other currencies. The dollar is the reserve currency of the world and the benchmark pricing mechanism for most commodities. Therefore, dollar appreciation caused the prices of many commodities to plunge to the lowest level in years. In December 2015, the Fed increased the Fed Funds rate for the first time in nine years. While the increase was small, the central bank promised markets 3-4 more rate hikes in 2016. The hawkish stance caused the prices of raw materials to plunge given the double whammy effect of both increasing cost of carrying inventories and a higher dollar, which are both negatives for commodity prices. There is lots of analysis and data collection that a central bank undergoes before it makes a change to monetary policy. While a shift from dovish to hawkish policy occurred in the U.S. over the course of 2015, there are no guarantees of the timing of interest rate moves. The central bank monitors the economic events to respond to conditions that are appropriate for changes in short-term interest rate policy. Given the volatility in foreign markets and slower economic growth, the FED decided to hold off on further rate hikes throughout much of 2016. The lack of rate hikes was a departure from the indications made by the central bank to markets in late 2015 and resulted in a weaker dollar and a continuation of low U.S. interest rates. As a consequence of the lack of central bank action, the dollar moved lower, and interest rates remained at the levels seen in December 2015 causing commodity prices to rebound. Just as commodities fell when the market believed the Fed would hike rates and the dollar would rally in late 2015, they appreciated when this did not occur. The Outlook for the Future: What Happens When Rates Move Higher? If history is a guide, higher interest rates in the United States, and around the world, will be a negative factor for commodity prices. When rates increase the cost of carrying, inventories will increase, and that will encourage consumers of raw materials to buy commodities on a when-needed basis rather than holding stockpiles due to the higher cost of financing. That is what history has taught us, and history tends to repeat itself when it comes to economic cycles. On the other hand, if the U.S. central bank waits too long to tighten further or increase interest rates, they run the risk of a sudden increase in the inflation rate. When inflation increases, more money chases fewer goods, and the prices of commodities will increase, sometimes dramatically over a very short period. When inflation increases to a point where prices move higher quickly, raging or hyperinflation can occur. In that scenario, the value of paper money can decline on a daily or even an hourly basis. That is why central bank policy is such an important balancing act. The charge of a nation’s central bank is to control monetary policy to make sure that economies do not overheat or decline in rapid fashion. Monetary policy is a critical tool in achieving the ultimate goal, which is stability. The chances are that when interest rates finally begin to rise from current low levels, commodity prices will fall. However, there are no guarantees because the reaction of raw material markets will depend on whether they are rising because of inflationary pressures due to many years of accommodative policies in the U.S. and around the world. Additionally, commodity markets are global in that people all over the world are consumers of raw materials. While central bank policy in Europe and Japan has led these nations to lower short-term rates into negative territory, economic conditions remain weak. Negative rates are likely to prolong the need for dovish policy initiatives in neighboring countries. The U.S. central bank must consider the monetary policies of neighboring nations because of international trade and other factors. Often, central banks of the world coordinate policy to achieve the best results for the overall global economy which is in the interest of all nations. From 2008 through 2016, world policy has been dovish when it comes to monetary policy. 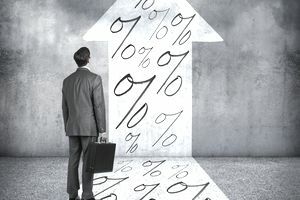 Growth has remained elusive, and that means the chances for a continuation of interest rates that are historically low will continue. However, there will come a time where the central banks will have to act to increase rates. The likely cause of interest rate increases will be increasing inflation. If you remember the story of Goldilocks and the Three Bears, the porridge was either too cold or too hot; it needed to be just right. If economic conditions become too hot, inflation will rage, and dramatic rate hikes will become necessary disrupting business and causing money or liquidity to disappear from economies. If it is too cold, and central banks continue to flood markets with cheap money via quantitative easing and low-interest rates, the chances are that so much money will flood into the system that inflation will become a result of more cash chasing finite goods. As you can see, the central banks of the world have a big job on their shoulders, and they need to act precisely and vigilantly to prevent economic disasters. If they get it right, commodity prices will fall or stabilize when rates rise in the future. While we remain in a dovish economic cycle around the world, the chances are that raw materials will continue to appreciate as they have since the beginning of 2016. That is why central banks pay particular attention to raw material prices and the rate of inflation; they set targets for the latter. The Fed’s current target is at 2%, and inflation remains below that level as of August 2016. However, that can change quickly as commodity prices can be the most volatile assets in the world. While the Fed left short-term interest rates unchanged through the end of November 2016, rates began to move higher in July as the bond market peaked. Longer-term rates move because of market forces. The results of the U.S. election and the prospects for rising economic growth because of tax cuts, a massive infrastructure project and fewer regulations promised during the campaign increases the chances that the Federal Reserve will increase the pace of rate hikes in the months ahead. Higher rates could weigh on the prices for some commodities and cause a bearish trend because of a stronger dollar, but increased demand for raw materials to accomplish infrastructure projects could support other staple commodities in the months ahead.